The Chicago-based coupon site Groupon, recently celebrated its five-year anniversary. To mark the occasion, Groupon updated its website, made significant changes to its mobile apps, and even made a move to expand into international markets. While this had led to the predictable amount of good press for the company, the news has not been all good for the company or its investors. This post will take a look at some of the events that are shaping the evolving future of Groupon, the good news, the bad news, and the ugly news. Groupon boasts that their updated website is more “sophisticated” and more search friendly. A big part of the redesign is the search feature that makes it easier for visitors to search through all of the available deals on the local area site. For example, searching for “tires” could bring up tire specials, mobile detailing coupons, or other car-related deals. 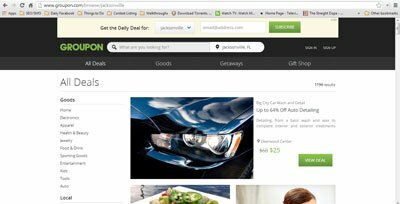 It’s part of Groupon’s effort to move beyond being a “Deal of the Day” site to becoming a coupon search engine that users go to whenever they are shopping. “In just five years, Groupon has grown from a daily deal website to a true online marketplace with a tremendous mobile following,” Groupon’s new CEO Eric Lefkofsky said in a statement. There have been similar improvements made to the mobile apps for Android and Apple. There is also a new “Local Explorer” feature that uses location data that pops up with nearby relevant deals. The same focus has been given to the search on mobile apps. Groupon also announced that they were going to buy Ticket Monster, an Asian mobile commerce company that had been owned by LivingSocial. The acquisition is seen as sign that mobile commerce and an international strategy are a part of Groupon’s plan for the future. Unfortunately for Groupon, its five-year anniversary and updates weren’t the only reason the company was in the news. Within a week of marking half a decade of operation, business released a third quarter earnings report that was lukewarm at best. Though the news of the acquisition showe the direction the company was headed, the fact remained that Groupon fell short of market predictions by about 3 percent. The company reported $595 million in sales when they had been projected to bring in about $617 million. In the past five years, Groupon has sold more than 400 million deals, racked up some 50 million app downloads and featured more than 500,000 merchants. But over the past year since the company made its initial public offering, the company’s stock price remains off about 60 percent. Pricing concerns and other issues may be warding off potential merchants, which in turn depresses the stock price. Corporate anniversaries, new technologies, and profitability questions are standard news fare for tech companies. But there is other news from Groupon that is a little uglier. A recent uproar over the use of branded keyword has given opponents of the site another reason to state why marketers should be wary of using the site. The issue involves Groupon buying ads with branded keywords which may be a disservice to the business using Groupon while inflating Groupon’s profit margin. When users pay to have deal shown on Groupon, the network promotes the deal by buying ads for search engines, social media networks, blogs, etc. This obviously beneficial to the user because it gets more exposure for their business and the special. However, it was recently noted that Groupon was buying branded keywords and posting ads that way. To illustrate the situation and the problem is creates, imagine that Company A, which sells shoes and hats, pays to run a deal on Groupon. Groupon then buys ads that show the deal to people searching for the term “hats” or “shoes”. However, they are also paying to show the deal to people searching for the branded term “Company A”. This means that instead of only attracting new customers, Groupon is essentially paying to let people who were actively searching for Company A (and would have likely paid full price for Company A’s services) buy at the extremely discounted prices (required by Groupon) that were supposed to bring in new customers. The prospect of this sort of cannibalization is bad for business owners and one of the reasons some marketers shy away from the service. To find out that Groupon is taking actions that would cause, rather than prevent cannibalization isn’t favorable news. Additionally, the motive for this behavior may be profit driven. When it comes to the bid prices, branded keywords (e.g. “Company A”) are much cheaper than regular keywords (“hats” or “shoes”) because only Company A wants it. This means that Groupon has a higher profit margin when people click on the Groupon deal after searching for branded keywords. Groupon hasn’t disclosed the amount it spends on branded keywords but their are some indications that it’s significant. A preliminary search by the group that first reported the issue found that more than one of four of the deals on the New York version of the site showed up as paid search results on Google when searching for brand’s name. For its part, Groupon has tried to downplay the issue. The fallout of the branded keyword issue is hard to estimate. If more merchants, now armed with knowledge, choose to opt out of Groupon’s branded keyword ads, this could hurt the profitability of the company. The PR and financial damage may even spread to other companies. LivingSocial, Groupon’s biggest competitor, declined to answer questions about whether or not they use a similar branded keyword approach (which leads one to believe that they probably do). Inspite of its shortcomings, some businesses may be able to effectively market their services using Groupon. The new additions to the website and mobile apps will make the platform more valuable for those who do choose to use it. For marketers, the tepid financial report for Groupon may be the start of multiple efforts to bring in new users with lower prices or other incentives, all of which are good for small business owners looking to make a large splash in their new markets. For those who can deal with the good, the bad, and the ugly of Groupon, there may find something there that they really like.